I’m taking you back in time to the days of high school English class where your teacher continuously referenced Aristotle’s ethos, logos, and pathos. Do you remember? Or, were you too busy dozing off to pay attention? ETHOS appeals to ethics, and is used to convince someone of the credibility or character of the persuader. LOGOS appeals to logic and is used to persuade through reason. PATHOS appeals to emotion and is used to convince an audience by constructing an emotional response. Is it all coming back to you now? Good. I’m glad, because these three writing techniques are especially important to you right here, right now. Yeah, that’s right. You can’t afford to kick this essential English lesson to the curb. After all, you’re an entrepreneur. You’ve got a killer product or service out on the market that’s begging for you to use the power of persuasion to get your ideal customers to buy. And, throwing lines of copy together for sales materials without thinking much of it just isn’t going to cut it. Instead, you need to integrate persuasive writing methods into your sales copywriting process for the ultimate reward—sales. Not just because I say so. But, because many thought leaders in the biz say so, too. With that, I’m here today to help you get a head start in the right direction by dishing out seven persuasive writing methods—building off of ethos, logos, and pathos—that will get your people to buy right away. No hesitation. No delay. These techniques I’m going to give you won’t take care of all the work. What I mean by that is, you must have a solid understanding of your ideal customer’s psychology before you go any further. Without that information, you sure as heck won’t know how to persuade even the most solution-hungry person in need of your product or service to alleviate their biggest headaches. That said, if you feel lost on exactly who your ideal customer is, we’ve got just the guide you need to pinpoint them from the crowd. Check it out here as soon as you’re done reading this post. 1. Stir the pot using the Problem-Agitate-Solve formula. I like to think of the infamous Problem-Agitate-Solve copywriting formula as stirring the pot. Yet, in order to do this successfully, you absolutely need to know the biggest, most painful obstacle your ideal customer wants and needs to overcome. If I’m being honest, you should already know that. Especially if your product or service idea has come to fruition. It’s a critical component of writing copy that evokes a response. Even so, once you’ve identified their main problem, you’ve got the green light to open up that wound and rub some salt all up in it. Paint a picture of their most painful, frustrating, annoying problem. For example, if you’re a chiropractor, your potential customer’s ultimate obstacle might be that they’re experiencing back pain. They haven’t forgotten that. You addressing it, however, illustrates to them you understand what they’re experiencing. But, let’s take it a step further to stir the pot just enough to compel them to take action. You’ve called attention to the source of their pain or frustration. Now, you need to bring in the all-powerful ethos to inject some emotion into your message. Maybe their back pain is taking away from precious time they could be enjoying with their children or grandchildren—running around, traveling, playing games; you name it. That’s pretty heart-wrenching, don’t you think? Yes, it definitely is. And, from there, it’s your product or service’s time to shine, guiding your ideal customer to the nearest exit so they can be free from any pain and frustration. It’s the relief they’ve been searching for. 2. Serve up some sizzling benefits. Let’s take it back to ethos, again. You can think your product or service’s features are the bee’s knees. And, maybe they are. But, if you want to get more sales, you need to show them exactly how those features can work for your people. How do you do that, exactly? By serving up some sizzling benefits. I’ve said it before and I’ll say it again: features tell, benefits sell. Reason being, benefits are the creme de la creme of showcasing exactly what your ideal customers can look forward to upon purchasing your offer. For example, say you’re a copywriter. A feature of the service you offer is search engine optimized content. The benefit? Getting discovered by ideal customers, while avoiding expensive advertising fees. If I was in need of copywriting services and saw that benefit, I’d want to become a client of theirs ASAP. I’m all about saving money. What about you? Here are more features and benefits examples from Vappingo.com to make your life a little easier. 3. Make your message memorable. Did you ever use mnemonic devices to help you memorize specific information to ace a test in school? Sure you did. How can you forget the Never Eat Soggy Waffles from your childhood days to remember North, East, South, and West? It just sticks. And, the reason for that is because the easier something is for our brains to process, the more preferred it tends to be. So, make your sales message more memorable by using repetition, rhyming, and comparisons. Repetition—countless studies have revealed a psychological basis for the power of repetition. That said, as Copyblogger.com suggests, make your point in several different ways, such as directly, in a story, using an example, via a quote from a famous person, and once more in your conclusion. But, handle this method with care. Try to avoid repeating the same word or idea over and over and over again. Rhyming—a study that was published back in the year 2000 revealed that poetic form can play in people’s perceptions of accuracy. Meaning, rhyme allows various statements to be processed by the brain more clearly. And, that can be perceived as truthfulness. Therefore, use a proper dose of rhymes in your copy, from your tagline to your product/service benefits, and even when addressing a recurring objection. Comparisons—using metaphors, similes, or analogies, you can make comparisons within your sales copy. More specifically, metaphors can help you explain complex topics and paint vivid pictures in your reader’s mind. Check out EnchantingMarketing.com’s post on how to use them the right way in your materials. 4. Back up your claims. “My product will help save you 20 hours a week.” How so? “This is the tool entrepreneurs like you are raving about.” Awesome. Now, show me who those rave reviewers are. “The numbers show that this is the product people want and need.” Okay, what are those numbers, exactly? You see, those claims are just that—claims. But, as soon as you dish out some client testimonials, data, and cold hard facts, those claims transform into powerful persuasion mechanisms that will help speed up the time it takes to get you those sales. If you’re looking for advice on how to gather testimonials for your product or service to back up your message, we’ve put together a list of four must-read tips. 5. Foreshadow their future with you. Sometimes, all you really need to do to send a prospect over the edge and into your customer roster is to tell them what they can expect their life to be like upon using your product or service. And, serving up some sizzling benefits, as I mentioned earlier, is one way to do it. If, however, you’re looking to take it a step further, get ready to flex your storytelling skills. Share how their life will be improved as they’ll no longer spend their nights worrying or trying to solve a problem that’s currently weighing them down. You can even use one of your current customers as the main character in a transformational tale—illustrating how your product or service actually stepped in and saved the day. Ultimately, foreshadowing your prospect’s potential future with you through storytelling will help them visualize what exactly it is they have to look forward to upon hitting your call-to-action button and becoming a paying customer. 6. Bring objections into the light. As an entrepreneur, there’s no doubt you’ll face your fair share of objections from potential customers. There’s no way around it. You just need to be prepared to swing back before they start doing the questioning. You see, if you leave your audience questioning whether or not they truly need your product or service after making your case in your sales materials, you haven’t done a good enough job at bringing objections into the light. So, in order to win the battle against any doubters that may be out there, it’s time to flip the script! 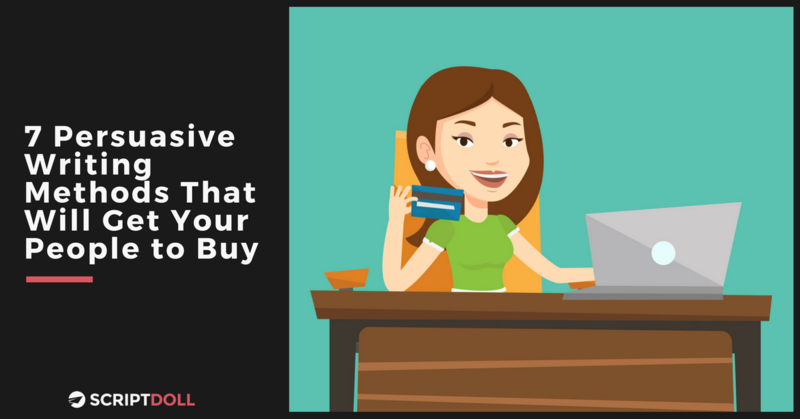 As I mentioned earlier, if you really know your ideal customer like the back of your hand, chances are, you have a pretty good understanding of what might make them hesitant to buy. “It seems like you know what you’re doing, but how do I know you really have the necessary experience to do this? Therefore, anticipate any of these objections to come from your ideal customers and resolve them in your copy. 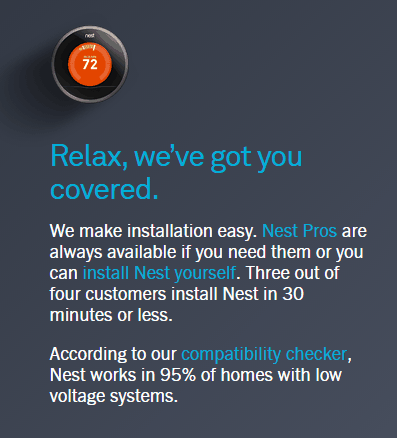 See how it’s done by the people at Nest. Objection dissolved. When you follow their lead, you’ll reduce the odds of a “yeah, but…” thought bubble popping up over your target’s head. 7. Error-proof it all before publishing. When you’re working hard to persuade your people to buy, it’s easy for things to go awry (there’s that rhyming technique!). That said, carefully evaluate your sales copy for consistency. If the main benefit you want to focus on is your product or service’s ability to save your customers time, then make sure that’s the focal point of your persuasive efforts. And, please, do yourself a favor and fact check your own testimonials and data before hitting “Publish.” The last thing you want is to diminish your credibility by accidentally adding on an extra digit to your customer numbers or distorting a client testimonial. And, I’ll leave you with this: getting those coveted sales involves a lot of hard work on your end. To be truthful, you need so much more in your arsenal than what was shared here today. That’s why we’re offering you our FREE eBook: “Pack on the Sizzle in Your Copy: How to Create Features and Benefits, Bonuses, and Induce FOMO to Devour Serious Sales,” delivered straight to your inbox. All that’s required to get your hands on it is your email. Just drop it into the box to the right-hand side of this page and you’ll be set! We want to know: which powerfully persuasive technique are you looking forward to using in your sales copy? Or, is there one we didn’t include that you use often? Drop us a line in the comments section below!